Bunch of 8 blue or purple orchids with cellophane wrapping. Fix Time Delivery : - We cannot commit sharp/exact time for delivery. Order will be delivered +20 or -20 mins as per selected time. The delivery will NOT be redirected/ redelivered to any other address in any circumstance. Our vendor partner will attempt delivery of the items once. In case the delivery is not done due to wrong address/ recipient not available/ premises locked, the customer shall still be charged for the order. If any products of unpreserved in nature, neither our delivery person nor PosyCity will be able to accept any returns of such items. 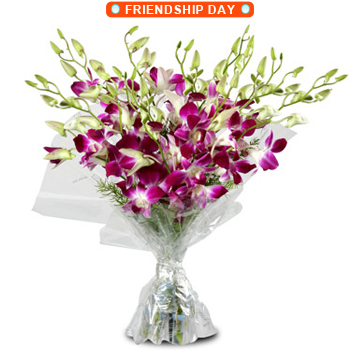 Actual delivered Product's design or pattern might differ from image shown as products/flowers are delivered from local city vendor and arranged by hand. Never Miss A Special Offer & Promotion with Posycity email alerts.